Flint’s own version of Jackie Robinson was also a once-in-a-generation athletic talent. Coleman played high school football at at Flint Central and college ball at Michigan State. He was a unanimous All-American in 1951, the first African American All-American football player at Michigan State. He was also the first Michigan State player to have his jersey number retired by the school. In 1968, he also became the first African-American to serve on the coaching staff at Michigan State. Coleman was elected to the College Football Hall of Fame in 1975. Coleman did not play football until his senior year. two of Coleman's older brothers had died in their youth, one from drowning and the other from pneumonia. Coleman's mother did not want her youngest son to be injured playing football. So Coleman played No.1 trumpet in the high school marching band and competed in swimming for three years, where he was the school's first African American swimmer. When Flint Central had a swim meet with Royal Oak High School, the Royal Oak coach "made it known Coleman would not be allowed to swim because a black swimmer had never been in their pool." Flint Central swim coach, Bob Richardson, stood behind Coleman and told the Royal Oak coach that, "if Don Coleman couldn't swim, then the rest of the Flint Central team would not swim." Coleman became the first black swimmer to enter Royal Oak's pool. As a senior in 1947, Coleman's mother finally agreed to allow her son to play football. In his first year of football, he was selected as an all-state offensive guard, and led Flint Central to the Michigan Class A state championship. He played principally at tackle Biggie Munn’s Michigan State squad from 1949 to 1951. At 178 pounds, he was the lightest player on the 1949 Michigan State football team. Coleman made up for what he lacked in size with quickness and intensity. In 1952, the Chicago Daily Tribune wrote that Coleman "probably is packed with more football per pound than any man in the United States." 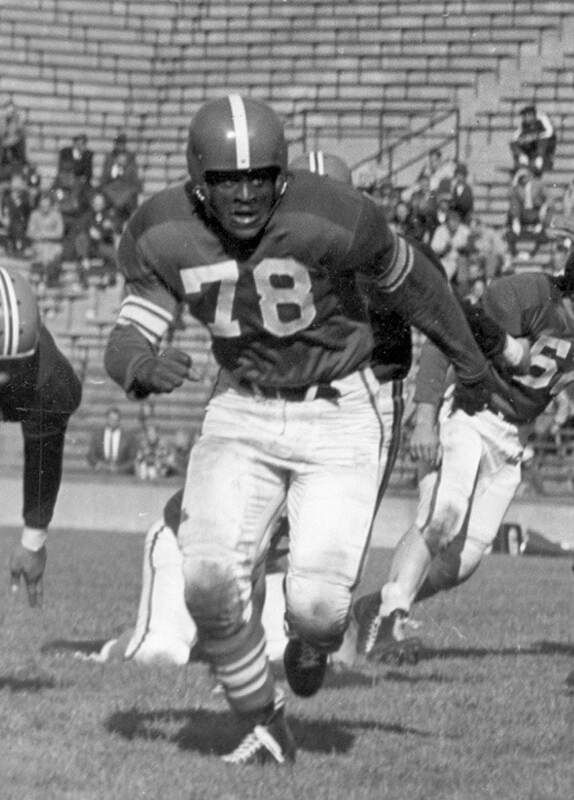 As a junior in 1950, Coleman played at every position on the left side of the line for Michigan State and was selected as the Midwest lineman of the week following a season-opening win over University of Michigan. Michigan’s legendary coach Bennie Oosterban said that Coleman's only rival among Big Ten lineman was Bronko Nagurski (who went on to become an NFL legend and Hall of Famer). Oosterbaan added, "Pound for pound, the Big Ten has never seen a better tackler than Don Coleman, who was smart, quick as a cat, and a deadly, fearless tackler." Coleman played for the Chicago Cardinals in the NFL in 1952 but military duty precluded his playing. After serving in Korea he returned to the Cardinals lineup. He started in exhibition games in 1954, but was traded to the Packers. He chose to instead return to teach and coach at his alma mater Flint Central. He was the first African American coach at the school, and went on to be the Dean of Students.